Traditionally T1-2N0 oropharyngeal carcinoma is treated with a single treatment modality, being either radiotherapy or surgery. Currently, minimally invasive surgery, such as transoral robotic surgery (TORS), is gaining popularity. The aim of this study is to assess whether T1-2N0 oropharyngeal cancer can be safely and effectively resected with TORS, and to determine the oncologic and functional outcomes. In addition, the long-term quality-of-life outcomes are reported. 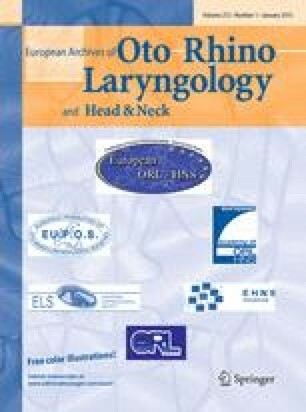 Between 2007 and 2012, 18 patients with early stage oropharyngeal cancers underwent transoral resection with the da Vinci robot system in the Netherlands Cancer Institute. All surviving patients filled out the self-report assessments of quality-of-life questionnaires. Median robot-assisted operating time was 115 min (range 43–186 min), while median estimated blood loss was 5 ml (range 0–125 ml). In three cases the exposure was insufficient to obtain clear tumor margins because of tumor extension and local anatomy. Fourteen patients had clear surgical margins. Four patients received adjuvant radiotherapy. Nine patients underwent an elective unilateral neck dissection. The oropharyngeal cancer recurred in two patients. Regarding the quality of life, patients who needed postoperative radiotherapy had a worse outcome and patients treated with transoral resection only did quite well. TORS seems to be an oncologically safe surgical treatment for early stage T1-2N0 oropharyngeal cancer based on this relatively small group of patients. Selecting patients in whom sufficient surgical exposure can be obtained, should be performed with the greatest care to avoid the need for adjuvant radiotherapy. Comparing radiotherapy and TORS or CO2 laser should be the next step in finding the optimal treatment for patients with T1-2N0 oropharyngeal carcinoma.